American Catholic leaders have pledged to “pull out all the stops” in expressing support of a proposed overhaul of U.S. immigration laws, according to Kevin Appleby, director of migration policy for the United States Conference of Catholic Bishops. As one part of the drive, Catholic bishops and priests in major dioceses plan to preach this Sunday in favor of immigration policy changes. The measure, which includes the possibility of citizenship for some unauthorized immigrants, has passed the Senate and has President Barack Obama’s support, but it remains stuck in the House. Catholic leaders say the Bible’s teachings on social justice are behind their stance on immigration reform, but they also acknowledged to The New York Times that demographics are a factor. About six-in-ten U.S. Hispanics (58%) are Catholic, according to a 2012 Pew Research Center survey. By contrast, about a fifth of the general public is Catholic (22%). Most American Catholics (73%) say that there should be a way for people in the U.S. illegally – and who meet certain requirements – to stay in the country legally, according to a March 2013 Pew Research poll. That’s similar to the share of the general public that holds this view (71%). Majorities of white evangelical Protestants (62%), white mainline Protestants (65%) and black Protestants (84%) also agree that it should be possible for unauthorized immigrants to stay in the country legally. But the U.S. public is more closely divided on the broader question of whether “immigrants strengthen the country because of their hard work and talents” or “are a burden on society because they take our jobs, housing and health care.” Among the general public, 48% say immigrants strengthen the country and 39% say they are a burden, according to aggregated Pew Research polling data from 2012 and 2013. At first glance, it appears that there are significant differences of opinion among religious groups on this question. However, these apparent differences are largely the result of underlying differences between religious groups in race, ethnicity, political ideology and party identification. After accounting for these factors, the independent impact of religion is minimal. 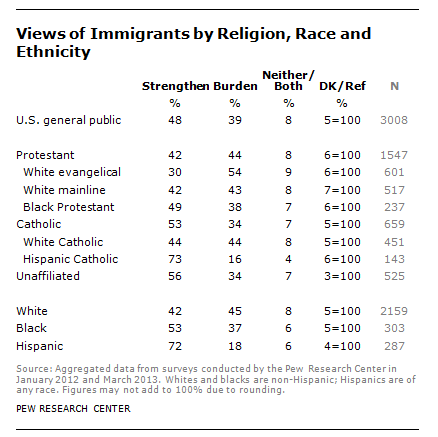 For example, while Catholics are more likely than Protestants to say that immigrants strengthen society (53% vs. 42%), much of this difference can be attributed to the larger share of Catholics who are Hispanic. About a third of U.S. Catholics (32%) are Hispanic, compared with just 7% of Protestants. Hispanic Catholics – a majority of whom are, themselves, foreign-born – are much more likely to say immigrants strengthen the country (73%) than to say immigrants are a burden (16%), much like Hispanics overall (72% vs. 18%). By comparison, white non-Hispanic Catholics are divided on this question (44% vs. 44%), similar to whites overall (42% vs. 45%). Note: The headline of this post has been updated to better reflect the content of the post.